Jill Duff - Why hire a Personal Trainer? 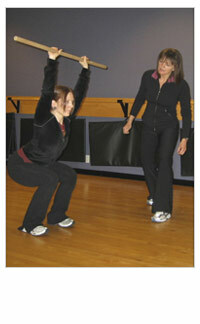 As a Certified Personal Trainer I'll guide and motivate you through your personalized workouts. Starting with an assessment to determine any obvious physical imbalances, I'll provide corrective exercises to benefit your posture and athletic or functional performance. This means you'll get exercises that are important and specific for you. I'll keep you focused on your fitness goals and ensure that they are realistic. I'll offer you a fitness program that enables you to achieve your goals, and I'll encourage you to train what you need. Why? Because with fitness, as with many areas of life, we aren't always aware of what we need. There's a lot of conflicting information in the media. Sometimes your goals are greater (or fewer) than your current abilities will tolerate. This means that the program you may benefit from could be quite different from what you imagined. You may have a sports specific or performance goal that requires the knowledge of an exercise specialist or you may require facilitated stretching to assist you with your flexibility and postural goals. Having worked in the fitness industry for over 20 years, I can connect with a wide range of clients. I am consistently involved in continuous learning and professional development to maintain access to current industry research. For those requiring a multi-discipline approach to wellness, I have a network of professional referrals. If you are in post-rehabilitation I will liaise with your health care provider to provide an appropriate program that progresses you safely to the next level. If you've had injuries, surgeries or been a competitive athlete, I can personally relate. If you have apprehensions or discomforts about exercise, I also understand. And if you are like so many individuals who are challenged by the need to change their diets, I've been there too. My Professional Coaching expertise will help you get to the root of the motivation required to lead an active life that is sustainable for the long term. You'll benefit from the accountability of working with a professional who is able to modify your workouts as you progress. Plus, you'll have fun! Laughter is guaranteed.